Locks are the most important security mechanisms at our disposal as they stand directly between our assets and any potential security threats. Ensuring that your lock is in good working condition and durable is important and shows that you are a responsible homeowner. Orlando Locksmith Solution is a 24x7 locksmith firm operating in Orlando, FL area and specializes in all lock-related solutions, including lock replacement and upgradation. Every day, new locks are introduced in the market with stronger security features than their previous models. Locks are getting smarter and stronger to offer ultimate protection from safety threats. In fact, digital locks have started gaining mass popularity since they are now within the reach of the common man. Do you want to be the only one in your neighborhood with an outdated lock? If you haven’t upgraded your locks in years, it’s time to consider an apartment lock change service from us. 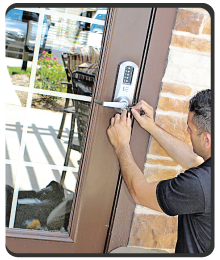 We can install all kinds of locking systems, including master and digital locks, and offer regular maintenance services to ensure that everything is in order. Looking for an apartment lock change but don’t know where to start? Don’t worry, we’ve got everything covered. Unlike regular locksmiths, we don't just provide installation and repair services but offer expert security guidance to help people choose the best security systems for their apartments. Our locksmiths double up as security advisors and can help guide you through a wide selection of locks, explain their features, and recommend the ones that are within your budget. Got an urgent requirement? Call Orlando Locksmith Solution immediately! We are available round-the-clock and offer overnight apartment lock change service anywhere in and around Orlando ! Rely on the best industry professionals for all your lock & key needs. Call us now on 407-498-2331 !